Heat 2 TBS oil in a large heavy skillet over medium heat. Add onion and garlic; cook, stirring often, until softened, about 8 minutes. Transfer onion to a bowl; wipe skillet clean. Add 2 TBS oil to skillet and increase heat to medium-high. Season chicken with salt. Add chicken to skillet and cook, turning once, until golden brown on both sides, 10–12 minutes. Transfer chicken to a plate. Add reserved onion, ½ cup parsley, and capers to skillet; cook for 1 minute. Stir in broth and vinegar. 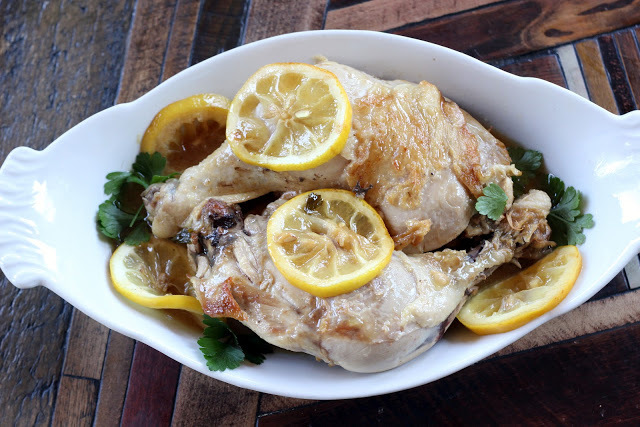 Add chicken with any juices and the lemon slices. Reduce heat to medium-low; cover and simmer until meat is tender and falling off the bone, about 1¼ hours. Transfer chicken to a large platter. Season sauce in skillet with salt and pepper. Spoon over chicken; garnish with parsley. Makes 8 servings.